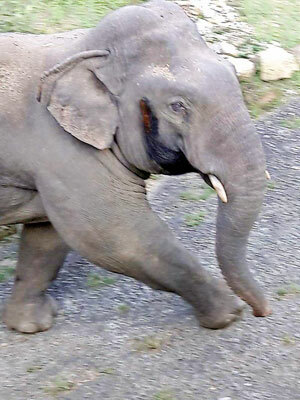 Investigations into crimes against animals should be handled as forensically as normal criminal investigations, a top animal crimes expert urged as sadness and anger swept the nation over the killing of the Udawalawe tusker, Mugalan, last week. The maximum penalty for the culprits was urged. “A proper crime scene investigation is the first step in tackling wildlife crimes,” said Ravi Perera, an international expert in wildlife crime who has offered, using his Serendipity Wildlife Foundation, to train Sri Lankan personnel to investigate such incidents. Mr. Perera has nearly 25 years’ experience in forensic investigation, with special expertise in wildlife crime. Now based in the United States, he is regularly engaged in solving wildlife crime cases in Africa, especially in Kenya where organised gangs of poachers hunt elephants and rhinos for their tusks and horns. investigators are dealing with possibly a decomposing carcass or a carcass that has been partially or completely devoured by another animal. 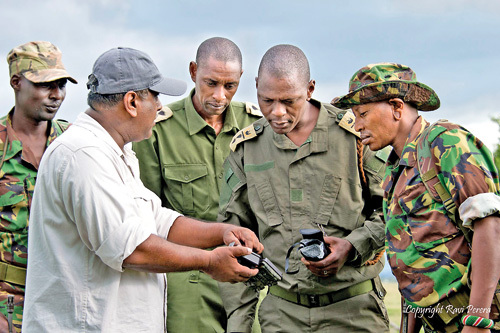 “Very often, we have to work in harsh surroundings, rough terrain, and even in dangerous situations where elephants and rhinos could return to the location to protect the dead,” Mr. Perera said. While a crime scene in urban areas could be sometimes worked with one or two personnel, a crime scene in the wild would require armed guards to secure the scene as well as personnel to take photographs, gather evidence and search the crime scene. The crime scene itself is much larger in the wild, where a suspect’s shoe or footprints or a tyre track from a vehicle could be located several hundred meters away. The animal could have been shot at one place but have succumbed to its wounds a distance away. The location where the animal was shot is as important as the place it died as key evidence could be found at either location or in between them. “In shooting cases such as Mugalan’s it is important to focus on key evidence such as the projectiles (bullets) recovered from the carcass. If the projectile is not severely damaged, there is equipment in forensic labs to determine the type of weapon it was fired from,” the expert said. Most projectiles found in animals remain intact due to body mass and bones unless there is an exit wound and the projectile is unrecoverable. “We also search for the casings that have been ejected from the weapon. Should a weapon be recovered, these casings can be matched in the lab to a test-fired casing from the weapon. Very often, a perfect match is enough to convict a criminal. “If a suspect is found, a suspect’s clothing that he wore at the time of the shooting can be examined for gunshot residue,” Mr. Perera said. Poachers in Sri Lanka also use wire snares and “hakka patas” – improvised explosive devices embedded in food that blow the animal’s head apart. “Unfortunately, obtaining evidence from snares is almost impossible,” Mr. Perera said. “You have catch the culprit in possession of the device to even consider prosecution. Mr. Perera, who works with international agencies in curbing wildlife crime, raised the need for Sri Lankan authorities to use new tools and technology. “Forensic tools and technology have increased in leaps and bounds within the last eight to 10 years,” he said. “When it was previously impossible to do so, presumptive blood tests, gunshot residue-testing, thermal imaging, infra-red photography, fingerprint analysis and much more can now be done onsite and the results obtained within a few minutes. “Forensic crime labs are also equipped with laser imaging and various light sources to analyse fingerprints and machines to process DNA and obtain results in about an hour,” he said. People often gather at the site of an animal killing to satisfy their curiosity but wildlife expert Ravi Perera said vital evidence is destroyed when the site is indiscriminately trampled over. Mr. Perera urged the public to support wildlife crime investigations by not disturbing the evidence. “Our aim is to prevent contamination of the crime scene. If a crime scene is contaminated, it could compromise the entire case,” he said. This is the reason that we secure an urban crime scene with yellow tape – to keep investigators in and keep all others out. “Every single item located in that crime scene is regarded as important. Cigarette butts, discarded and crushed receipts, bus and train tickets, clothing, blood, water bottles, tyre tracks, shoe/foot prints and drink cans can be potential evidence. A receipt from a shop (with a date and time printed) can be used to identify a suspect on the shop’s video surveillance system, and then we have a ‘face’ to work with. Environmentalists argue immediate action is necessary to control an exotic pet turtle, the red-eared slider before it causes hefty ecological costs on the country. Living standards in the Northern and North-Western provinces will be badly affected by changing climate and the economic engine of the Western Province will also falter, according to a World Bank study that links GDP to the impact of climate change. The Agriculture Ministry will seek Cabinet approval to lift the ban on the transport and sale of wild boar meat in the face of opposition from wildlife activists, citing the need to prevent the protected animal’s raids on cropland. 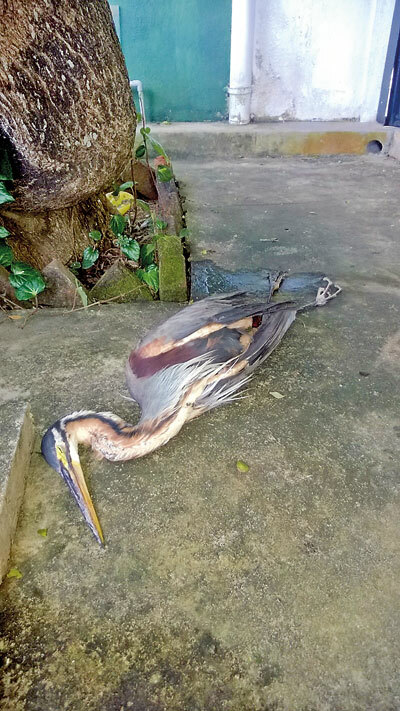 A large number of birds that inhabit the park and migratory birds are also under threat as their source of food, fish in the lagoon are dying due to the pollution. Sri Lanka President Maithripala Sirisena said safeguarding environment is vital for the survival of all creatures including humans and that is why he had not taken many high positions entrenched with money and power and selected the Ministry of Environment to ensure the right to life of all the creatures including the human beings. The statement states Norway and Sri Lanka share a similar conviction on prioritizing the conservation of the fragile marine environment. The President said that all the public servants in a respective district will be liable for the environmental damage occur in that particular district and further requested to inform him if there is any political influence when enforcing the laws against environmental damage. A passenger train hit and killed three young elephants in eastern Sri Lanka weeks after two calves and their pregnant mother were fatally struck in the same region. A 48-year-old father of three, died in Indigahawewa following an elephant attack. A team of veterinary surgeons have started treating the injured foot of this elephant at the Hondawel Pokuna Wewa area in Hambantota. Standing out in Brad’s filmography is the unusual film Landfill Harmonic. It is the story of the recycled orchestra of Cateura, a small community outside the capital city of Asunción, Paraguay. The instruments they play are entirely made from garbage. It is the kind of story that filmmakers crave, but takes a rare eye to hunt down. “Both entertaining and educational”, it looks at the power of music as a tool for transformation, as well as the message of believing in yourself, not giving up your dreams, and making the most out of what you have in life. A party having a dip in the river’s shallows found a long-tailed creature with a disc-shaped body patterned with many small dark spots or reticulations. From one end to the other, it was about 1 foot long. Biologist Rex I. De Silva identified the creature from a photograph sent to him by bather Geemal Harold as a honeycomb stingray or banded whiptail stingray (Himantura uarnak).“The honeycomb stingray is a common marine species in our coastal waters but finding one in freshwater is unusual,” Mr. De Silva said. The stingray is named after the barbed stinger on its long tail, which is primarily used in self-defence. Rays and skates are flattened fish closely related to sharks. They do not have hard bones like other fish but a skeleton of flexible cartilage such as found in the human ear and nose. Marine sharks and rays occasionally enter freshwater during spring tides, Mr. De Silva said. In times of drought, when river levels fall, seawater intrudes some distance up rivers at high and especially spring tides. Sharks and other marine species follow the seawater for a considerable distance upriver. Shark sightings in the Menik Ganga have been recorded over the past 30 years but not sightings of rays. 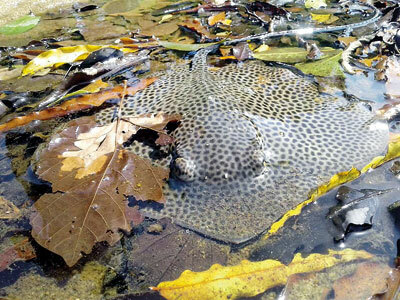 The disc-shaped body of the honeycomb stingray found by Mr. Harold’s party was about 30.5cm (one foot) in diameter but the species can grow up to 2m (6.6 feet), so the one found in Yala would be a young stingray that decided to have an adventurous journey upstream. The stingray’s tail, called “maduwa” in Sinhala, which can be three times its body length, was dried and used in olden times as a whip for punishment, the barbs on the tail inflicting great pain. Rays are masters at bottom-dwelling. They have eyes on the top of their head/body and so relies on other senses in finding food (crustaceans, small fish, snails, shrimp etc.) on usually murky ocean beds. Special organs on their face called ampulae allow them to navigate and find prey with electromagnetic signals. Sadly, stingray numbers are in decline due to over-fishing, habitat loss and climate change. At present, 539 species of ray are on the International Union of Conservation of Nature’s (IUCN) Red List of endangered species, with 107 classified as threatened. 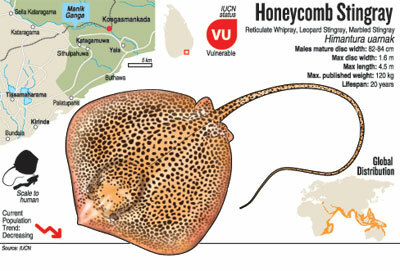 The honeycomb stingray is categorised as “vulnerable”, making this Yala sighting special. To prevent the needless slaughter of up to 10,000 snakes a day by people panicking over snakebite death, toxinology expert Dr. Kalana Maduwage is urging the public to use a snake identification website he has masterminded to find out if a snake is venomous. The Snake Identification Service (www.snakesidentification.org) will assist doctors and others to accurately identify creepy-crawlers and save both human and snake lives – news to celebrate tomorrow (July 16) on World Snake Day, which highlights the diversity of snakes and the important role they play. Sri Lanka has rich snake diversity with approximately 105 species, more than half of them endemic to this country. Most of the snakes are non-venomous and not a threat to humans. About 15 species of sea snakes and only a few of the 90 land-inhabiting species, such as the Indian krait, cobra, Russell’s viper, saw-scaled viper, hump-nosed viper and Ceylon krait, have lethal bites. Snakebite is a major medical public health issue in this country with about 80,000 people being bitten annually, resulting in about 400 deaths. Most of the victims are farmers in poor agricultural communities, with most being admitted to hospital for anti-venom treatment. There are two kinds of venom, so early and accurate identification of the snake responsible for a bite is critical in treating the patient. Anybody in difficulties can log on to the computerised Snake Identification Service to obtain help. Users are asked to upload information about the snake of concern or interest to them. “The expert team behind the Snake Identification Service will be immediately notified and we will respond quickly,” Dr. Maduwage said. 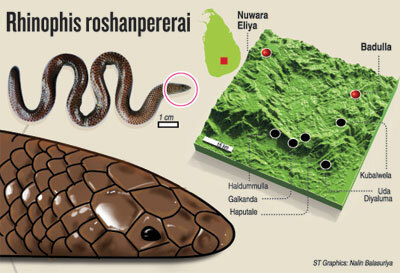 Dr. Maduwage, a senior lecturer in the Faculty of Medicine at the University of Peradeniya who has carried out important research on snake bites and treatments, has also developed a series of video lectures that explain snakes and treatments for snakebite. This nine-part series titled “Snakebites: The Whole Story”, covers all important aspects of Sri Lankan snakebites and can be accessed freely on YouTube through links on http://www.snakesidentification.org. Dr. Maduwage believes these lectures will fill the knowledge gaps on issues related to Sri Lankan snakebites. It is often difficult to find accurate information on snake identification, bites, clinical features, hospital investigations, treatment, first aid, preventive strategies and other issues, Dr. Maduwage said. Even in standard medical and other textbooks, updated information on these areas is missing, leaving medical professionals groping for answers to snakebite complications they face. The first part of the lecture series gives an overview of Sri Lankan snakes and their high diversity. 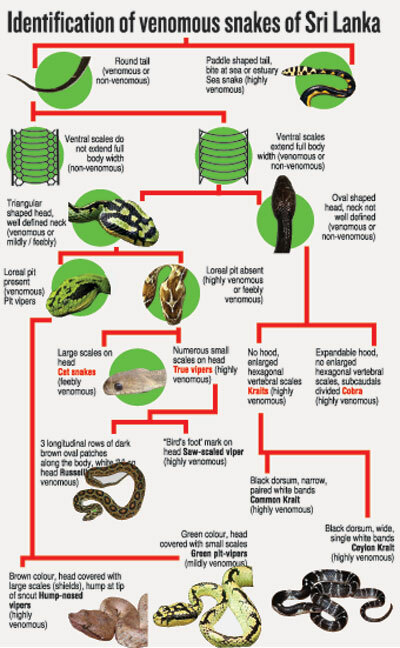 The second covers the identification of venomous snakes and easy ways to distinguish them from non-venomous snakes. There are four lectures on clinical features of snakebite, investigation, treatment and snake antivenom that are specifically for medical professionals in Sri Lanka confronted with snakebite victims. The lecture series also covers first aid in treating snakebite, useful for people who either live or work in snake-prone situations. A lecture on the prevention of snakebite describes where snakes are commonly found and their activities. The final presentation is on the conservation of Sri Lankan fauna, including threats to snakes. Dr. Maduwage, who has discovered a number of snake species, emphasises that snakes, as top predators, play a vital role in eco-systems as they control the breeding of pests such as rats in paddy fields, helping to save crops. Snake venom is used to produce antivenom and many other medications. Several common antihypertensive drugs such as Captopril were developed from snake venom. “So the presence of venom is not a reason to kill snakes,” Dr. Maduwage pointed out. “As far as I know, about 10,000 snakes are killed every day only in Sri Lanka due to lack of identification and the wrong impression that ‘all snakes are dangerous’,” he said. Dr. Maduwage said he was grateful for the help of medical student Parakrama Karunatilleke in setting up the Snake Identification Service website, and for the assistance of three young doctors, Dr. Bhagya Nikapitiya, Dr. Sajith Tillekeratne and Dr. Asiri Seneviratne, in developing the YouTube lecture series. Wildlife officers raiding a house in Rajagiriya two weeks ago found 21 snakes including a green pit viper, python, green whip snakes, ornate flying snake and cat snakes being kept without a permit by an ayurvedic practitioner. The man, who was later released on bail, said he had kept the snakes for educational and identification purposes – which the law allows ayurvedic doctors to do if they obtain a permit. Decades ago, ayurvedic treatments using medicinal oil and medicinal stones claimed to have antivenom properties were more popular than western medicine for treating snakebite victims. Ayurvedic doctors, sometimes commonly known as “beheth thel karayas” (people who sell medicinal oil) used to exhibit snakes in public areas as a tactic to grab people’s attention to sell their products. “Keeping snakes for education/identification is a fake excuse. We can educate people without live snakes,” Dr. Kalana Maduwage said. 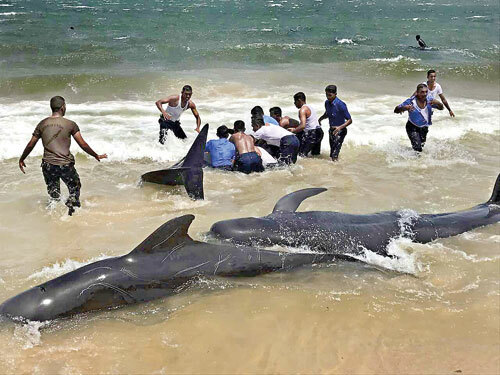 A pod of about 20 pilot whales stranded on Sampur beach in Trincomalee were pushed back to sea last Wednesday by some navy-men and locals. 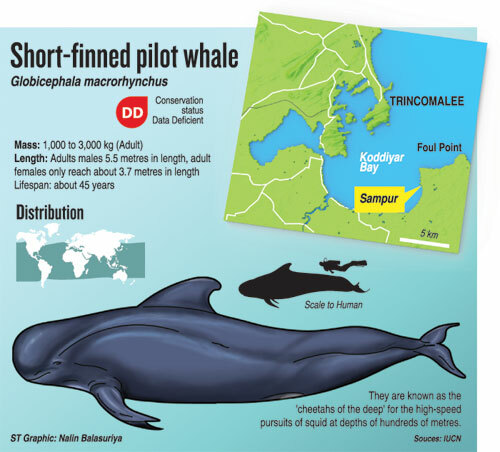 Marine mammal expert Ranil Nanayakkara, identified them as short-finned pilot whales (Globicephala macrorhynchus). While this is rare in Sri Lanka, there have been occasions elsewhere when pilot whales have run aground. Mr Nanayakkara points out that in February more than 400 pilot whales washed up on a New Zealand beach. Beached whales die due to dehydration, or drowning when high tide covers the blowhole. In some cases, they die by collapsing under their own weight. Available literature indicates that about 10 species of whales – mostly toothed whales are more prone to being stranded than others. Why whales get beached in an apparent suicide mission remains a mystery. Many whales use echolocation to navigate, so one theory is that man-made sonar in ships etc. may be interfering with whales and/or natural brain wave activity causing them to become disoriented. Seismic activities on the ocean floor too could be contributory factor. Most of the whales have close-knit family units, so another hypothesis is that a pod of whales can accidentally become stranded when attempting to come to the aid of a beached whale that is sending out distress calls. A pilot whale pod can be made up of 20 to 50 individuals, but large super pods with hundreds of individuals too are frequent. They are primarily matrilineal or a female-based society with strong family bonds, so if one swims on to the beach, the others could follow. They have an acute sense of hearing according to marine researchers, making them more prone to stranding. In 1918, over 1,000 pilot whales got beached in New Zealand. Although the pilot whale’s behaviour resembles that of larger whale species, it belongs to the oceanic dolphin family. Pilot whales are large, robust animals with a bulbous head and no discernible beak. They are black in colour. A male pilot whale can grow up to 5.5 metres (18 ft) in length, whereas adult females are about 3.7 metres (12 ft) in length. The short-finned pilot whale primarily feeds on squid while certain species of fish and octopus too are included in their diet. They dive deep 300 metres (1000 ft) deep or more in search of prey and spend great lengths of time at depth. Pilot whales are also known as the ‘cheetas of the deep’ for their ability of high speed pursuit of prey deep in the ocean. As landslide deaths become increasingly regular in Sri Lanka during heavy rains, a community-based science programme offers a life-saving mechanism. Getting to know about an imminent landslide even a second earlier could make a big difference, but often the early signs are ignored. To address this issue, an ambitious programme was launched last year. Nature often gives early landslide warnings such as changes in the landscape, cracks on walls and difficulty in closing or opening doors or windows. (read the box story). Drawing people’s attention to such early warnings is one of the aims of the Community-Based Landslide Early Warning Project (CBLEW). It teaches people in a landslide-prone community to monitor early signs and prepare an initial response. The National Building Research Organization (NBRO), the premier institution responsible for dealing with landslide prevention, has identified several risk zones. NBRO Geologist Darshani Rajapakse said the CBLEW project had been introduced to about 100 villages in Badulla, Nuwara Eliya and Kegalle. The first step of the programme is to educate the communities on early signs of a landslide and how to respond when disaster occurs. The villages are then taught how to use simple equipment such as a rain gauge, a basic but useful device that can save lives. According to scientists, 75mm rain for 24 hours in a landslide-prone area should put the people on ‘alert’ while 100mm rain upgrades the risk level to a ‘Warning’. A rainfall of 150mm for 24 hours means it is time for ‘evacuation’ for safety. The third stage of the programme trains the villagers to map the danger zone, identify safe areas to run in case of a disaster and plan safe passage for evacuation. The last stage of the project involves the setting up of a monitoring committee consisting of active participants chosen from the community. Ms. Rajapakse said the communities were also taught how to use extensometers which monitor earth movements. She said the NBRO had plans to set up automated extensometers in risk areas where cracks had been sighted. If any major movement of the earth is detected, relevant people are notified through a text message. 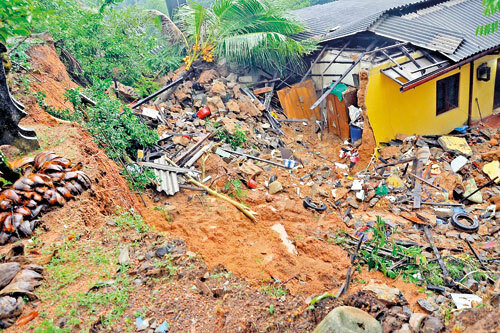 According to NBRO studies, 20 percent of Sri Lanka’s land or 13,000 square km in 13 districts is landslide prone, with the Badulla, Nuwara Eliya, Matale, Kandy, Kegalle, Ratnapura and Kalutara districts being the top seven districts on the danger list. Areas with isolated mountains and earth mounds in the Monaragala, Kurunegala, Gampaha, Galle, Matara and Hambanthota districs have also been identified as danger zones. The NBRO said it wanted to implement the CBLEW project in all the areas identified as danger zones. Changes occur in your landscape such as patterns of storm-water drainage on slopes (especially the places where runoff water converges), land movements, small slides, flows, or progressively leaning trees. 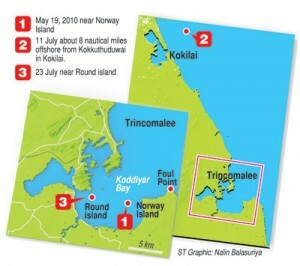 Wildlife offcials suspect that the carcass of a female dugong found afloat in the northern seas off Mollikulam on Thursday July 27 with a new-born calf may have been drowned after being trapped in a fishing net. Dr Sevvandi Jayakody of the Department of Aquaculture and Fisheries of the Wayamba University, said that the female was over seven feet in length and the calf was about three-and-a-half feet in length and well developed. She said she was saddened. Dr Lakshman Peiris of the Department of Wildlife, said the aminals may have died of suffocation after they had been snared in a fishing net. The dugong needs to surface to breathe from time to time. If one gets entangled in a net it would not be able to to breathe. In this instance, the mother may have aborted the baby. Dugong (dugong dugon) known as ‘Muhudu Ura’ in Sinhala, is considered to be ‘critically endangered’ in Sri Lankan waters. They are seen only in the Gulf of Mannar and Palk Bay area in the northern ocean. They are protected by law, but a number of dugongs get killed every year. Dynamite fishing is a major threat, while other fishing gear such as gill nets are death traps. Last year, at least 13 dugongs were killed. 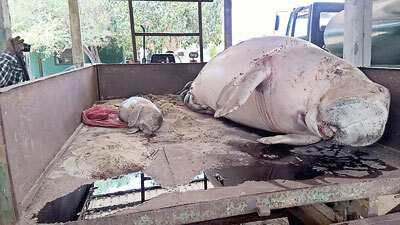 Ocean Resources Conservation Association, reports that another dugong was killed last month in Pukkulum, Wilpattu. 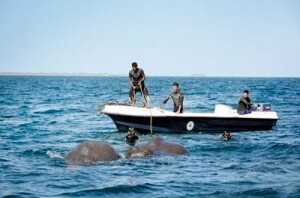 A project funded by Global Environment Fund Project and Mohamed bin Zayed Species Conservation Fund with management of the United Nations Environment Programme is carrying out ground work to help protect dugongs. Experts are surveying the dugong habitat to identify a protected. Sri Lanka is also a signatory of the memorandum of understanding on the Conservation and Management of Dugongs and their Habitats throughout their range (Dugong MoU) of the Convention on Migratory Species. The flower with pinkish fleshy petals and strong fragrance regarded as ‘sal’ is a favourite flower of the Buddhists. But they are not aware of its real identity. While Vesak is only few days ahead, the real sal trees in Royal Botanical Gardens, Peradeniya are in bloom. According to botanical gardens sources, the trees start flowering in early April and still there are unopened buds on higher branches. So, it is likely they will be flowering closer to Vesak and you may still have a chance to witness the real sal, in the gardens. ‘Sal’ is sacred to Buddhists as legend has it that Prince Siddhartha was born in a garden of sal trees in Lumbini and His Parinirwanaya occurred in Kusinara again under sal trees. Vesak commemorates the Birth, Enlightenment (Buddhahood), and Death (Parinirvana) of the Gautama Buddha, so it is interesting that a flower associated with two notable events bear flowers closer to the period of Vesak. However, the real sal is a small white flower that blooms in a tree scientifically called as shorea robusta. Though these flowers are smaller and has no fragrance, there is indeed some sacredness in its appearance. But then what about the large pink flower with a strong fragrance that we commonly know as sal? 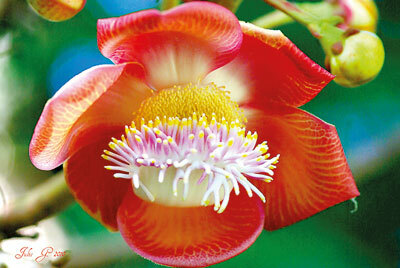 The pink flower blooms in the cannon ball tree (couroupita guianensis). While the real sal tree is native to India/Nepal, the imposter is native to South America according to botanists. The cannon ball tree bears large rounded fruit that resembles a ‘cannon ball’. Dr Siril Wijesundara – botanist and the former director general of Botanical Gardens Department says that the first sal tree has been planted in the Royal Botanical Gardens in 1880, but sal trees had existed elsewhere in Sri Lanka before that. He recalls there are about seven sal trees in the gardens. The real sal tree, shorea robusta, belongs to a family called dipterocarpaceae to which the ‘hora’ trees belong to. The sal tree can grow up to 35 metres and a girth of about 2 to 2.5 metres in about 100 years under favourable conditions according to botanists. Sal is also a popular timber tree in Asia. Like hora, the fruit of shorea robusta has tiny wings to assist its distribution in the wind. The flower misidentified as sal, has pinkish fleshy petals and a strong fragrance. The large flower is about 6 centimetres wide and has a hood-like bulge which conceals a small white nodule in the centre of the flower that looks remarkably like a small stupa. Up in the hood, there are finger like structures, which some see as deities worshipping the stupa. So, the imposter tricks the unwary Buddhists to think it is the real sal flower. The tree doesn’t have any timber value. Dr Wijesundara also pointed out that Buddhists in Thailand too regard the wrong flower as the sal flower. Tracing back the history of the misidentification, Dr Wijesundara pointed out that in 1901 King George VI planted a cannon ball tree in the Peradeniya gardens and it was identified as couroupita guianensis, meaning that this mistake was not detected. Dr Wijesundara recalls seeing a mural by S.P. Charles at Colombo Museum, which featured the wrong tree. So he believes the mistake could have occurred later. To mark the peace talks of 2002, the tree planted at Rose Garden Hotel by Anton Balasingham, and Professor G L Pieris, was also the wrong sal plant. Even in movies portraying the life of the Buddha, the cannon ball tree has been seen. Prof Namal Gunathilake – another veteran botanist, shares an incident where the mistaken identity of real Sal tree caused trouble. At an Ayurvedic conference, one research team that tested an Ayurvedic recipe reported that the combination of medicinal compounds doesn’t work. But when Prof Gunathilake queried about the compounds they used, it was revealed that they used the barks of the wrong tree. Sunil Sarath Perera – a song writer and a pioneer environmental activist said that the sal tree is recorded in history. The Salalihini Sandeshaya which has been written during the Kotte era has referred to sal trees and the Dutch Thombu clearly mentioned ancient village names referring to sal. Mr Perera said that Salpita Korale where he was born is such a name and in Kirulapone villages such as ‘palle pattuwa’, the name refers to the location of sal trees. Mr Perera has also seen the aesthetic side of sal forests in India. “In north India there are stretches of sal forests. With its ivory colour flowers and less undergrowth, the sal forests are tempting for anybody to rest under their shade. He says it is not surprising that Queen Mahamaya decided to rest in a sal forest. During his three-week stay in Jim Corbett National Park, Mr Perera had visited the jungle, riding on elephants in search of royal bengal tigers. The Botanical Gardens Department in 2012 under the guidance of Dr Wijesundara distributed about 900 sal saplings to temples around Sri Lanka. Meanwhile, the fragrant, beautiful cannon ball flower qualifies for religious offerings. In Japan, the blossoming season the sakura or cherry blossoms, is slowly coming to a close. The season starts in March and lasts until early May when cherry trees in different regions come into full bloom on different dates. Having analysed the dates of these blooms in Kyoto in Japan since 800 AD, Japanese scientists have found that the sakura is blooming earlier. They worry that this is a result of global warming, where a warmer March stimulates the trees to bloom early. The Koha or Asian Koel (Eudynamys scolopaceus) is considered the harbinger of Sinhala and Tamil New Year for its beautiful song aimed at attracting a mate. Its call can also be heard beyond Sri Lanka’s shores. The Koha’s call is heard even in Australia, reminding Sri Lankans who live there of Avurudu. A search on the video sharing social media platform YouTube suggests the Sydney Koha is different. It is not the same species found in our island, but the Eastern Koel or Pacific Koel scientifically classified as Eudynamys orientalis. This bird is also called the Common Koel and its male is easily identified by its glossy black plumage, tinged with blue and green, and striking red eye – similar to the Koha found in Sri Lanka. The female has glossy brown upper parts, heavily spotted with white, and a black crown. 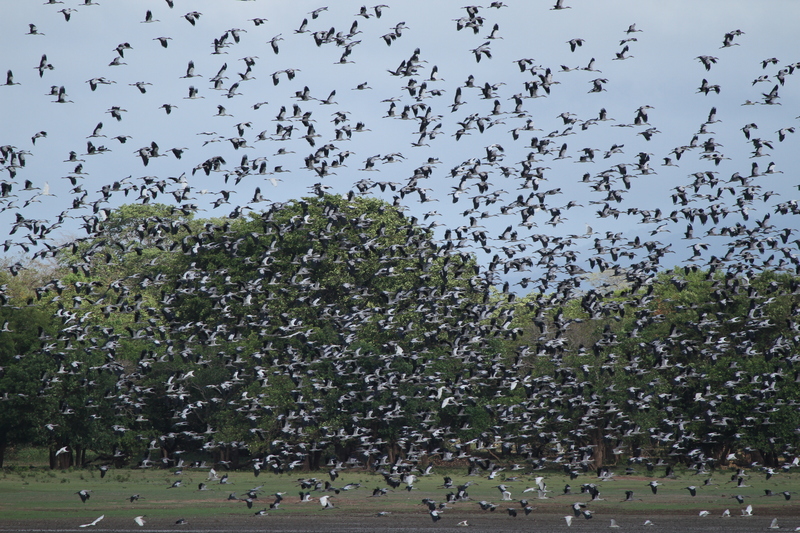 But unlike in this part of Asia, the Koels in Australia start to sing in September or October. According to BirdLife Australia, the Eastern Koel is a species that migrated to Australia from areas north – New Guinea, Indonesia and possibly the Philippines. It breeds in northern and eastern Australia, mostly in Queensland and NSW, southwards at least to Sydney, where they are common in the suburbs. A few venture into eastern Victoria, and vagrants have been seen as far afield as Melbourne, the Murray River and Adelaide. They remain until March or April, when they return to their non-breeding grounds. This explains what Sri Lankans living in Australia have been hearing. It is colloquially known as the rainbird or stormbird, as its call is usually more prevalent before or during stormy weather. According to the literature, the closely related Asian Koel, Black-billed Koel and Pacific Koel form a superspecies which are sometimes treated as subspecies. Superspecies is defined as “a group of largely allopatric species which are descended from a common evolutionary ancestor and are closely related but too distinct to be regarded as subspecies of one species”. The Asian Koel is a brood parasite which lays it eggs in the nests of some other birds. In Sri Lanka, the Asian Koel particularly chooses a crow’s nest. But in the Australian conditions, the Eastern Koel lays its eggs in the nests of Red Wattlebird, friarbirds, the Magpie-lark and figbirds that are usually smaller than the Koel. The young Koel will grow to nearly twice the size of the parents, but the foster parents continue feeding it until they realize the mistake. Eventually, the young birds migrate northwards, usually later than the adults, to return as a breeding bird the following spring, accordign to the BirdLife Australia. The songs of the male Eastern Koel amazingly resemble those of the Koha in Sri Lanka. Visit http://www.youtube.com and search for “Eastern Koel Calling” to listen to their calls. Our pre-historic humans took refuge in caves that hide many secrets that are helping archaeologists piece together how humans evolved thousands of years ago, the respected archaeologist, Professor Raj Somadeva said. Recent excavations in a number of caves have produced archaeological finds showing how prehistoric humans, initially living as hunter gatherers, gradually moved to a living based on agriculture. The changing climate at the end of the last Ice Age about 12,000 years ago triggered this change, and evidence of the missing era between Balangoda Man and written history is gradually being assembled. Prof. Somadeva made these revelations last week at a news conference organised by the Science and Technology Ministry to brief media about the archaeological research being carried out through a National Science Foundation (NSF) grant. With this funding, a number of caves inhabited by pre-historic man are being excavated. “We are having two field work sessions every year, each about one-and-a-half months long during the dry seasons, February-March and August-September. The rest of the year is devoted to analysing the findings and documentation work,” Prof. Somadeva said. Research on human evolvement in Sri Lanka was pioneered by Dr. P.E.P Deraniyagala who excavated skeletal remains of anatomically modern Homo sapiens in 1955 from sites near Balangoda. 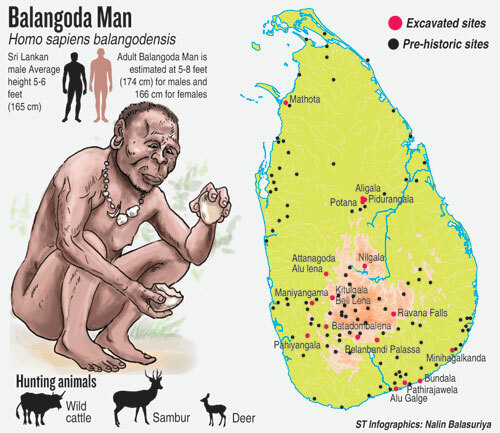 He named this Homo sapiens balangodensis, commonly called Balangoda Man, a being that lived 38,000 years ago. Some 36 skeletons of Balangoda man have now been unearthed from different parts of Sri Lanka together with stone tools. We have little evidence of the transformation of this man to the modern era. Written history indicates that a population from neighbouring India colonised Sri Lanka, and this is attributed to Vijaya’s arrival. Of course, those who came from India could have brought in a technically advanced culture, but the humans who lived on the island were already an advanced group and it is likely that our pre-historic man’s culture mingled with the introduced culture, Prof. Somadeva believes. There is little evidence on the pre-Vijaya era and that is the period the archaeologists are trying to unearth. Prof. Somadeva calls this transition period a “twilight period of our history”. He says most of these knowledge came from the experimentation of early home-grown humans. The archaeologists also found pendants and other non-utilitarian items, and Prof. Somadeva said this is evidence that our early humans showed cognitive ability, knowing the concept of self. They also found shark teeth in some of the caves. The sea is about 40km from the location of the findings so this indicates our prehistoric man travelled to exchange items from other tribes that lived closer to the sea. The scientists have also found colourful beads that could have been used for necklaces which have been sent to a laboratory in the United States for carbon dating to determine their age. The team also found artefacts believed to have been used in rituals, including a sharp stone tool with a bloodstain on one side. Finding bloodstains on such artefacts is extremely rare. Prof. Somadeva said scans by the Medical Research Institute found red blood cells but more was needed for extracting DNA; the team is still hopeful of this. The archaeologists are also seeking help on the star formations in the skies above Sri Lanka thousands years ago. They have found a piece of rock with holes in it, similar to artefacts found in China and Israel. Chinese archaeologists think their stones indicate stars in Orion’s Belt, and the Sri Lankan stone could be similar. “During the drier period, the stars look bright so this could be something our historic humans used to try to read the sky to predict climate,” Prof. Somadeva said. The findings could effectively make a paradigm shift of the history that we know at the end of the project, he predicted. Exploring life in the darknessCaves with areas of different light penetrations can be refuge to some of the least studied animals and plants. The scientific study of organisms living in caves is known as biospeleology, and Peradeniya scientists recently studied caves in Nuwara Eliya to explore the life in the darkness. Research by Chathurika Munasinghe of the University of Peradeniya under supervision of Prof. K.B. Ranawana on the Mandaramnuwara and Rotupihilla caves in the wet zone was presented at the Wild Lanka symposium recently organised by the Department of Wildlife Conservation. Six vertebrate and 12 invertebrate animals were identified in the Mandaramnuwara cave and six vertebrate and 11 invertebrates were identified in the Rotupihilla cave, Ms. Munasinghe said. Bats are common in both these caves with the common wentwing bat and rufous horseshoe bat being the most common. Insects and spiders accustomed to darkness were also found.Also seasonally the edible nests swifts build in the darkness of these caves. Fish are being dynamited as they shelter in the historically important shipwrecks scattered around Sri Lanka’s coastline, damaging valuable eco-systems and putting tourist earnings at risk. Blast fishing is one of the most destructive fishing practices, used to stun or kill schools of fish for easy collection. 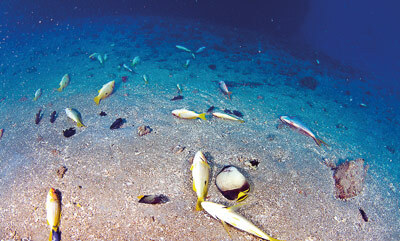 The explosion destroys underlying habitat such as coral reefs that supports fish as well as other marine life. Fishermen detonated explosives in the wreck Orestes, also known as Tango Wreck, which lies off Hikkaduwa, according to divers posting on the SubAqua Club forum. A few months ago, another incident was reported by diver and marine expert Nishan Perera who took photographs of many dead big and small fish floating near the British Sergeant wreck off Passikudah after a dynamite fishing explosion. The wreck suffered some damage and nearby coral had been broken. “On that day we reached British Sergeant around 9am and there was some fish floating on the surface, gasping for air,” said Thusitha Ranasinghe, an amateur diver who witnessed the destruction. “We immediately knew that the ship wreck has been dynamited a few minutes ago and that the fishermen had left when they saw us coming. “When we dived there were a lot of dead fish on the seabed and trapped on the deck of the sunken ship, and a lot of half alive fish trying to keep their buoyancy and gasp for a last bit of air,” he added. There could be more than 200 shipwrecks around the coast, about 50 of which can be reached by diving, according to the comprehensive Dive Sri Lanka website. Five hundred years of trade, commerce, conflict and war from the time of the Portuguese, Dutch and the British resulted in a vast amount of shipping traffic all round the coast and a corresponding high number of wrecks, Dive Sri Lanka states. Most of these wrecks have been located, including world’s first purpose-built aircraft carrier, HMS Hermes, which was sunk off Batticaloa. Shipwrecks creating special underwater attraction providing shelter for marine life becoming potential to be steady magnets for dive tourism that is still in at fancy level. 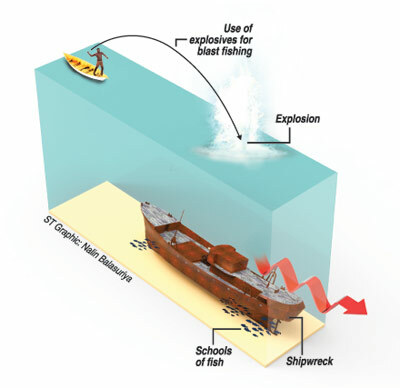 There is also the danger that fishermen dynamiting a wreck might do so carelessly while there were divers underwater. The Editor of Dive Sri Lanka, Dharshana Jayawardena, recalled one such incident, “It was scary. It sounded like a tank exploding underwater, and the foreign tourists who were underwater with us were really scared. Fortunately, the dynamiting happened about 1km away, but the tourists with me swore they would not come again to Sri Lanka,” Mr. Jayawardena said. “The dive industry in Sri Lanka is poised to grow hugely so this will have some real impacts on our international standing and ability to compete in the international dive market quite apart from the terrible environmental consequences” said Naren Gunasekera, who is lobbying to stop blast fishing. Statistics show there are 23.7 million certified scuba divers in the world with 2.7m going on diving holidays. They are reportedly big spenders so this niche tourist segment would be economically beneficial but if we destroy our corals and shipwrecks there wouldn’t be anything to attract the tourists, Mr. Gunasekera points out. A sunken ship turns to an artificial coral reef, providing living and breeding habitat for enormous amounts of marine life. Dynamiting these shipwrecks for their fish and the metal is like killing the goose that lays the golden eggs. Dynamite is not only used on coral reefs and shipwrecks, it is being thrown into nets where large schools of fish are caught in order to prevent the fish tearing the net. Marine mammals such as dolphins and even the endangered dugongs are reported to be killed by dynamiting. Sadly, because the destruction happens underwater, only divers can see the damage. It is important that the authorities understand the issue and take action to stop it, marine activists say. It is, however, very difficult to carry out raids at sea to nab blast fishing culprits as they are highly organised, using mobile phones to convey alerts of approaching navy or police boats and dumping the evidence. The fish die mostly of the shock wave, hence there is no physical damage that helps to prove they have been killed by blast fishing. “Action to stop blast fishing needs to be taken on land, not at sea,” says Arjan Rajasuriya who was formally at National Aquatic Resources Research and Development Agency (NARA). As blast fishing is widespread, happening daily in many parts of Sri Lanka, Mr. Rajasuriya points out that those who illegally acquire a huge amount of dynamite should in any case be considered a threat to national security. “In the same way that police and security forces nabbed the terrorists during the time of war, a good intelligence network is needed to find the source of the dynamite supplies and then stop them getting them into the hands of fishermen,” he said. Adding another national park to Sri Lanka’s protected areas, the government declared the wilderness around Kalawewa and Balaluwewa a sanctuary. 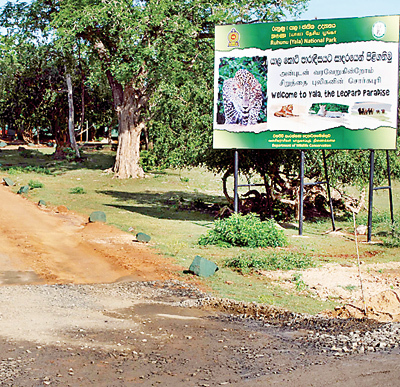 Wildlife and Sustainable Development Minister Gamini Jayawickrema Perera declared open the national park yesterday. Environmentalists welcome the move saying the protection was long overdue. The Kalawewa reservoir was built by King Dhatusena who ruled the country in the fifth century. He also built the Balaluwewa and linked them to make a very large tank to be used for ancient agriculture. These tanks were renovated and now hold water all year around, attracting wildlife. In the case of elephants, as happens at the Minneriya and Kaudulla tanks where the “Gathering” of elephants takes place as the water levels drop in the dry season, the tank bed becomes lush grassland, providing the animals with fodder. As the Kalawewa-Balaluwewa complex is fairly shallow, the effect is more noticeable. GPS radio-tracking of a female and male elephant by the Department of Wildlife Conservation and the Centre for Conservation and Research has shown that some of the herds remain in the vicinity throughout the year. Elephant herds on the banks of the Kalawewa are particularly famous for the high number of tuskers. Many wildlife enthusiasts visit the area regularly. Rajiv Welikala, a nature enthusiast and wildlife photographer who visits the area annually, says it is one of the most beautiful places in Sri Lanka. “There could be 150-200 elephants at Kalawewa with dozens of tuskers, both young and mature. “The birdlife in the tank is also fascinating, with a very large openbill stork flock that consists of thousands of birds. When they take wing the sound can be heard from a distance,” he said. Sadly, the number of elephants at Kalawewa appears to be decreasing. Conservationists fear the electric fences constructed to minimise human-elephant conflict are preventing seasonal movement of the elephant herds, blocking their use of other areas. In recent months, three other national parks in the northern region were declared: Delft Island, Chundikulam and the Adam’s Bridge sand islands. The Kalawewa National Park became the country’s 26th national park. Although we have a considerable number of parks, most of them are experiencing problems from poaching, over-visiting, invasive species, herding of cattle etc. In the case of Kalawewa, it is critical to ascertain the ranging patterns and habitat use of the elephants and design barriers based on that information. If the entire park is surrounded by boundary electric fences, that will spell the end for the elephants, for whose benefit it was created. 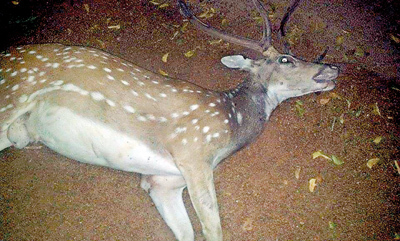 Since the re-opening of Yala National Park on October 7, four Spotted Deer have been killed by speeding vehicles on the recently carpeted Kirinde – Yala road. An adult male antler that died of head injuries was among the four that were killed. The road from Kirinde up to the Park’s ticketing office was carpeted a few months ago. Earlier, motorists could not speed on this stretch due to the bad condition of the road. The road borders the Nimalawa Sanctuary and animals cross it mainly at dusk, the time of day when a majority of the accidents occur. 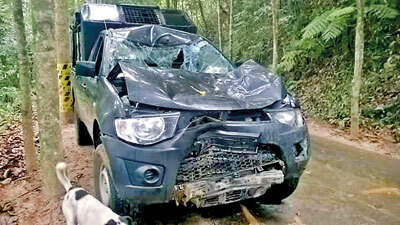 Sampath Galappaththie –Yala Safari Jeep Association coordinator says not only deer, but many smaller animals have fallen victim to speeding vehicles. Even Bee-eaters who hop onto the road to sun bathe have met their end on this stretch, Mr.Galappaththie said adding that the deadliest stretch was about three kilometres from the ticketing office. Following the death of a leopard by a speeding vehicle inside the Yala National Park, speed humps were set up. Our question is whether officials are waiting for a leopard to be killed on this stretch too for remedial steps to be taken. A couple of years ago a leopard was killed on the Buttala-Kataragama road and it is only a matter of time for such an accident to occur on this stretch too. Meanwhile Department of Wildlife Conservation (DWC) Director General H.D. 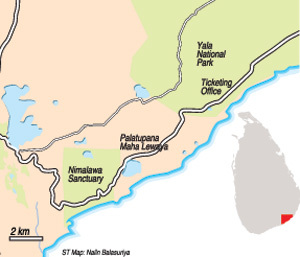 Ratnayake said the road is located outside the protected area and hence its maintenance was the responsibility of the Road Development Authority (RDA). However he said DWC would work with RDA to find a solution. However, when the Sunday Times contacted RDA they were unaware of the problem. They said that if such a problem existed, solutions like building speed humps could be looked in to.